ST. GEORGE — Here are the results from tonight’s Region 9 games. 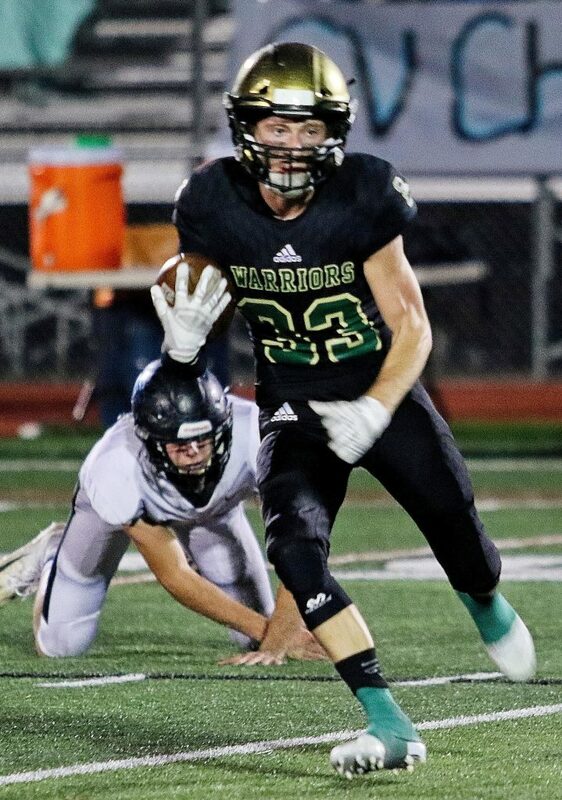 In a battle for the fourth playoff spot in Region 9, the Warriors and Falcons battled all game Friday night, with Snow Canyon sneaking away with a close victory. 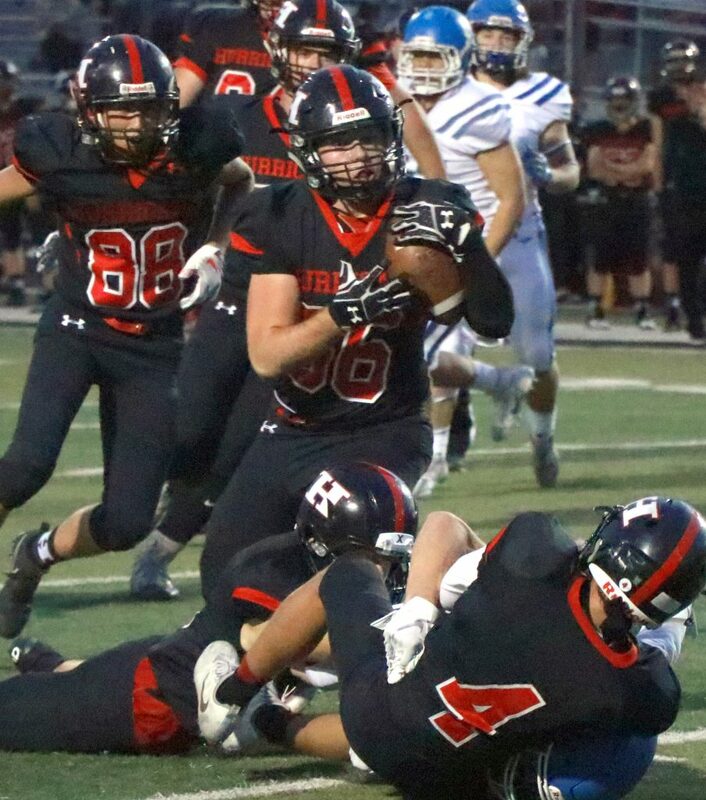 After the Warriors took an early 3-0 lead, the Falcons took their first lead of the game with just under three minutes left in the first quarter when Colten Shumway threw a 15-yard touchdown pass to Brady Lowry. After a missed PAT, Canyon View held a 6-3 lead. Snow Canyon regained the lead early in the second quarter when Landon Frei found Jase Mendenhall from nine yards out, making the score 10-6 after a successful PAT conversion. The Warriors extended their lead at the 7:11 mark of quarter two when Ryan Bethers punched it in from one yard out for a 17-3 lead. Snow Canyon’s offensive onslaught continued after Canyon View cut the lead to eight. Bretton Stone ran 16 yards for a score, making the score 24-9 at the six-minute mark of the second quarter. The Falcons cut the deficit just 34 seconds later when Brayden Cavaleri unleashed a 55-yard touchdown bomb to Lowry, cutting the lead to 24-18. The Warriors added another second quarter score with just 12 seconds on the clock when Frei found Stone in the end zone from 29 yards out for a 31-18 lead at the half. After both offenses lit up the scoreboard in the second quarter, they settled down in the second half, with the score holding until the fourth quarter. Canyon View made the game close when Shumway ran it in from the four-yard line with 4:02 left in the game, cutting the Snow Canyon lead to six, 31-25. The Warriors defense would hold firm for the remainder of the game to clinch the win. Snow Canyon’s offense gained 329 yards on the ground. Miles Reynolds led the Snow Canyon rushing attack, gaining 102 yards on 12 carries. Stone added two touchdowns (1 rushing, 1 receiving) and Frei threw for 92 yards and two scores. With the win, the Warriors improved to 3-5 overall, 2-3 in Region 9, tightening its grasp on the final region playoff spot. With the loss, Canyon View drops to 3-6, 2-4 in region play. Both teams will play their regular season finales next week. The Falcons will take on non-region opponent Murray on Wednesday at 7 p.m. Snow Canyon will play Hurricane at 7 p.m. on Thursday, looking to clinch a playoff spot. After falling behind in the fourth quarter, the Thunder came roaring back, tying the game at 30 before outlasting the Pine View Panthers 52-44 in triple overtime. In an offensive showdown between the two rivals, Desert Hills came out on top in a shootout. The Thunder got on the scoreboard first when quarterback Logan Wilstead threw a 23-yard touchdown pass to Tate Denos for a 7-0 lead. 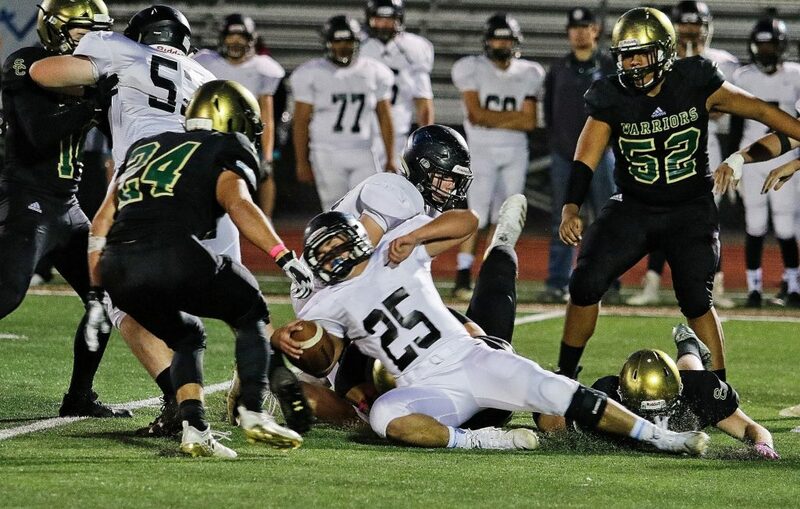 After both teams traded scores and Desert Hills took a three-point lead, the Panther defense stepped up near the end of the first half, forcing a fumble on a reverse. A few plays later, Connor Brooksby hit a 26-yard field goal to tie the game at 17 going into halftime. When the second half started, the offensive fireworks continued. After two field goals, Pine View quarterback Dallin Brown found the end zone from three yards out at the 1:36 mark of the third quarter, giving the Panthers a 27-20 lead. Pine View added a field goal at the start of the fourth after a fumble recovery, taking a 30-20 lead. After cutting the lead to seven following a field goal, Desert Hills tied the game when Wilstead connected with Denos for a 34-yard touchdown play, forcing overtime. After both teams traded touchdowns during the first two overtime periods, the Thunder found the end zone in the third overtime and converted the mandatory two-point conversion attempt. 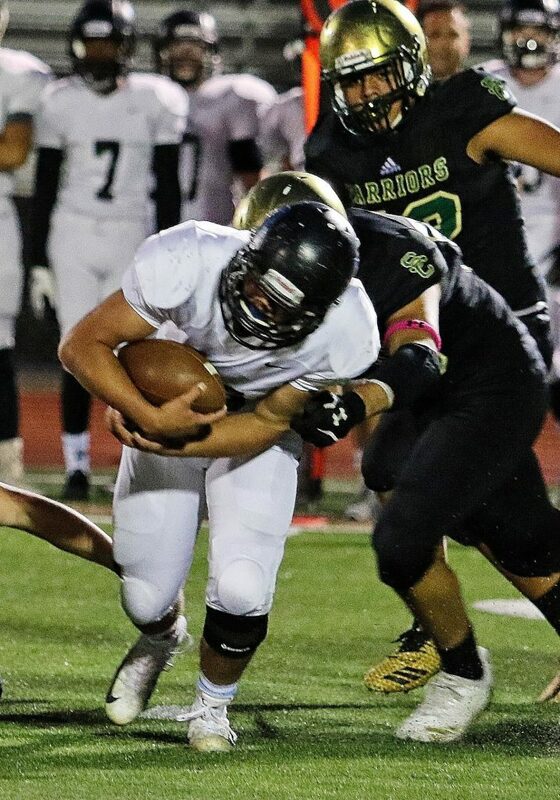 The Panthers tried to equalize on the next series, but Damen Brunson stripped the ball from Pine View running back Tosh Wright, and Desert Hills recovered to seal the win. The Thunder improved to 6-2 overall and a perfect 5-0 in Region 9 play. With the loss, Pine View drops to 5-3 overall, 3-2 in region play, giving the Panthers the third seed for the upcoming state playoffs. Next week, Pine View will face Cedar at home in the regular season finale at 7 p.m. on Thursday. The Thunder will square off with the Dixie Flyers in a battle for the Region 9 championship. The game will begin at 7 p.m. on Thursday. Fueled by a series of untimely first-half miscues on the part of host Hurricane, the region-leading Dixie Flyers coasted to a 59-0 shutout win over the Tigers Wednesday night. Complementing the Flyers’ seemingly unstoppable offense was a tough defense that forced multiple turnovers early in the contest. Dixie scored on its opening drive, which ended with a 10-yard TD run by Preston Moore with 9:21 left in the first quarter. A few plays later, Hurricane was forced to punt from its own 26-yard-line, but center hiked the ball over the punter’s head and was recovered by the Flyers deep in Hurricane territory. Soon thereafter Dixie’s Nate Mahi ran the ball into the end zone for a TD, putting the Flyers up 14-0. 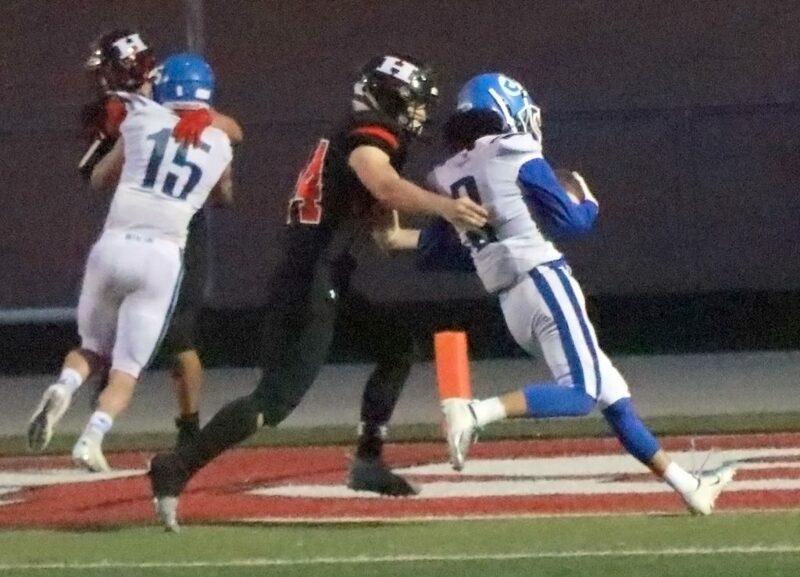 Hurricane then fumbled the ball away on its next play from scrimmage, setting up yet another Dixie score, this one on a run by quarterback Reggie Graff. 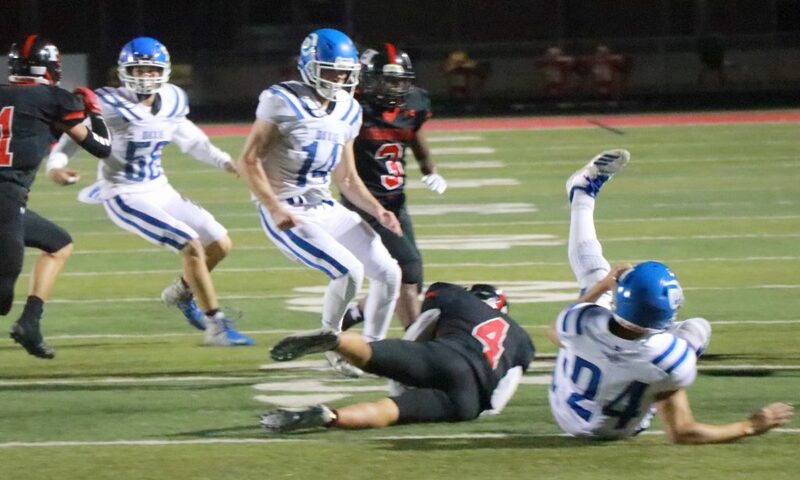 Dixie then capitalized on an intercepted pass that led to another TD by Graff, after which another botched punt led to a field goal kick by Josh Stewart, which gave the Flyers a 31-0 lead at the end of the first quarter. In the second quarter, Dixie added three more TDs, the first of which was a 45-yard pass from Graff to Josh Cazier and the second of which was a 55-yard run by Moore. Hurricane then fumbled away the ensuing kickoff, setting up yet another Graff rushing TD that put the Flyers ahead 52-0 at halftime. With the mercy rule keeping the clock running in the second half, the game’s only other score was a 75-yard run by Moore, his third TD of the game. Dixie kicker Josh Stewart was 8-for-8 in PAT kicks in addition to his successful 25-yard field goal. Dixie improved to 5-0 in Region 9 play with the victory, while Hurricane dropped to 0-5 in region with the loss. Both teams finishing out the regular season next Thursday, with Dixie hosting Desert Hills and Hurricane playing at Snow Canyon. Kickoff time for both contests is 7 p.m.